In Zulu, "to celebrate" is jabulani, which is also the name of this year's new soccer ball. While a normal soccer ball is made of 32 panels--a mix of hexagons and pentagons--the Jabulani has only 8 panels. And instead of being stitched together, which creates deep grooves, the panels are thermally bonded. This means the surface of the ball seems to be smoother, overall, compared to the classic black-and-white ball. But apparently, a bumpier surface is better. That's why golf balls have dimples: they cause the air flow to hug the ball tightly, which reduces drag and makes the ball fly straighter. With a smooth surface, the air flow kind of zips off from the ball and creates a wide wake behind it. You can see this in the video from Caltech that I screen-grabbed above. Instead of hugging the back of the ball, the air is shooting away from it. 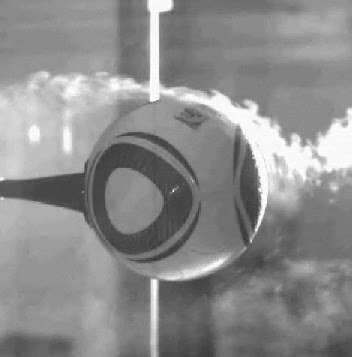 Researchers say that this might make the new soccer ball fly in an unpredictable way. I'm sure that British goalie will be eager to agree. His sound poem called "Thwok!" is both ridiculous and pretty awesome. ...Actually, you should just listen to him reading the whole thing, because the British accent makes it better. But isn't some silly rhyming a nice foil to the usual earnestness of Wimbledon? I'm sure Ogden Nash would have thought so. And he certainly would have wanted me to balance out all the seriousness on this site with some lighthearted poetry. So here's Ogden, commenting on--what else?--the inkfish.